The class teacher in Pearl is Ms Zalesnakova and teaching assistant Ms Watts. PE lessons are every Monday morning and Wednesday afternoon. Please remember that children can not wear any jewellery during PE lessons. Every child needs to bring their own PE kit which should include a white T-shirt, black plimsolls, black shorts for the boys and black leggings for the girls. Telocvik mame kazdy pondelok a stredu. Deti musia mat svoj vlastny ubor – biele tricko, cierne cvicky, chlapci cierne sortky a dievcata cierne leginy. Deti nesmu mat ziadne nausnice, naramky ani retiazky. Pearl is a class for children that are new to English. The curriculum is specifically designed to suit the needs of children who are new to the country, have not previously been to school and have little or no English. This topic, apart from learning about family and family members, also includes learning ‘survival’ vocabulary that helps the children to communicate their basic needs, such as greetings or being hurt. The children learn to name basic body parts and healthy habits, such as brushing their teeth and washing their hands. The story of this half term is Titch. This story helps children with learning about family members and also toys, describing different sizes and feelings. We will have a visitor coming to talk to children about old toys, how the children used to play in the past and we will compare this to games and toys the children like to play with today. In this topic the children learn to name different kinds of food, drinks, fruit and vegetables. They learn about food that is healthy and unhealthy. The children grow their own vegetables (cress or salad) to make their own healthy sandwiches. Part of this topic is also learning about the life cycle of a butterfly. During this half term the children learn a story about The Very Hungry Caterpillar and Handa’s Surprise. The focus of the lessons is simple description of different foods in the stories. The children learn to name colours, describe how the food feels and what it looks like. This term we will be going to a local shop to buy ingredients for a healthy salad and we will also go to Rotherham to see panto. In this topic the children will learn to name clothing and the materials it is made from. They will explore different materials learning appropriate vocabulary to describe their properties. They will use then a variety of materials to design own clothing. The story of this term is Cinderella and The Washing Line. The children will continue to learn using adjectives when describing the characters in the story. In Maths they will continue working with numbers to 10 learning to add and subtract, to create addition and subtraction stories and to sort data in tables, diagrams and pictograms. We will also begin Music lessons with Laura Lister from Music Hub learning new songs and chants. On January 26 we will be going to Millennium Gallery to participate in Portrait workshop. In this topic the children will be learning to name different places in school, parts of the house and furniture. They will be exploring places near their homes and learn to make simple maps. The children will be learning the story about Goldilocks and the Three Bears. We will go on a walk in the local area – exploring Tinsley and Tinsley Canal. During summer term the children will be learning about animals. They will be learning to name domestic as well as wild animals. They will be learning about animal homes, what the animals eat and describe what they look like. The children will be learning to write simple non-fiction reports about animals. The story of this topic is Monkey See, Monkey Do. 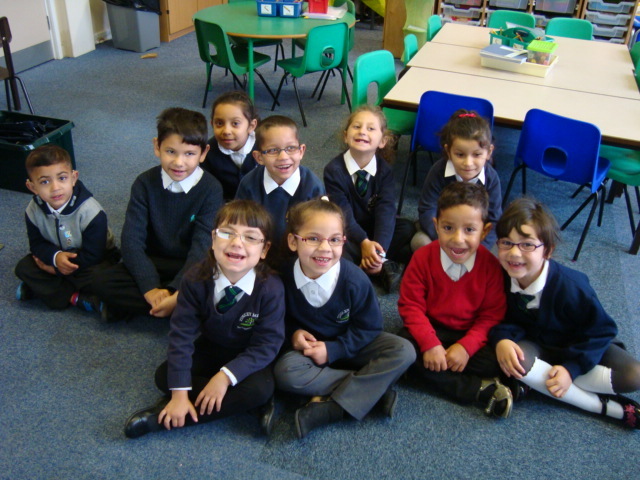 This term we will go on a trip to Butterfly House together with Opal and Crystal classes from Upper Meadows. Great part of each topic is also Music and Art. The children will learn at least one new song related to the topic each half term. Songs are also a very important part of Phonics sessions so as to help the children learning the new sounds as well as new vocabulary. Art helps the children to express themselves, their feelings and their way of looking at what they are learning at the time. It encourages discussion, whether in mother tongue or English language.